Who’s behind The Big Shwop? Inga, Sarah and Chrissy founded The Big Shwop – a concept that they started in August 2008 right here in Aotearoa New Zealand. Sarah hails from Taranaki, called Wellington home, but now lives in Raumati South. She’s really into being a mum to two boys, fair trade coffee, gardening, quality fiction, large hounds, travelling places, social history, dress-ups, ethically made things, wine, hanging socks out in pairs, documentaries, cooking, sustainable fashion, tidy sheds and dancing about being a goon. She once had a sky-diver land on her. Sarah is not keen on battery farms, injustice, science fiction and sports wear. Inga also hails from Taranaki but lives in Wellington. She’s been in TV production and has worked on some cracking shows like ‘How to look good naked’ and ‘You are what you eat’ over in the UK as well as the Winter Olympics and the Americas Cup. She’s just finished a telly series here which she feels pretty darn flash about. Inga is currently spending far too much time oogling travel sites as is getting desperate for some sunshine. Inga is really into live music, George the cat, travelling places, wearing wigs and lippy to parties, fresh pasta, spending time with her girls, wine, film, film, film, old skool party games, West Coast beaches, sustainable fashion, pretty scarves, the Mediteranean and dancing about being a goon. She once had a goat that she dressed up in a babies bonnet and trained to jump over obstacles. She’s not keen on ridiculous big cars that use heaps of petrol, wetas in your gumboot and chess. 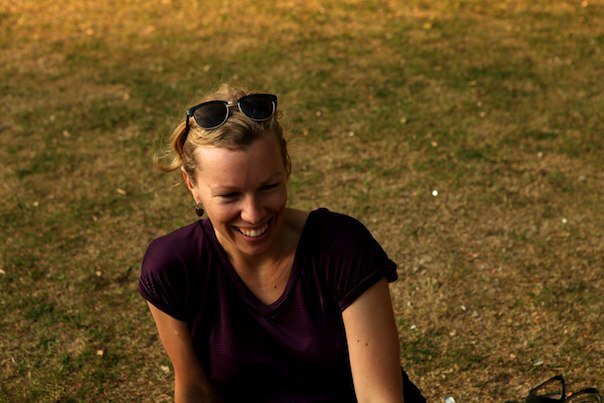 Jenny is also from Taranaki and recently returned back to New Zealand after nine years in London. She works as a freelance graphic designer, and practices aromatherapy on the side. She spends far too much time oogling at design, photography and fashion blogs. Jenny loves flat whites, long walks, festivals, martini’s, markets, travelling, baking banana bread and vintage shopping (especially on Brick Lane). She’s not keen on moths that eat your nice woolly clothes, bad radio stations and jig saw puzzles that have missing pieces. Chrissy hails from the Hawkes Bay and lives in Auckland. She’s been in event management for some time and is an organisational whizz. She’s done heaps of sailing around the world which she feels pretty darn flash about. Chrissy is really into travelling places, natural remedies, snowboarding fast, spending time with her girls, wine, campfires, sun,sun,sun, tennis, yoga, Japanese food, festivals, dress-up parties, sustainable fashion, gorgeous boots, and dancing about being a goon. She once had a boyfriend that threw up on her feet. She is not so keen on liquorice, holes in socks or plastic bags.